Exclusively from Taylor's & Co., the Short Stroke revolver is an improved single-action revolver perfect for competition shooting or the avid arms collector. It can be built with the low-set Smoke Wagon™ hammer or the lower and wider profile Runnin' Iron® hammer. It also features a blue finish with a case-hardened frame, and a richly detailed, checkered grip for comfort and improved aim. For shooters that prefer a larger grip the bigger, Army style Gunfighter grip is also an available option. 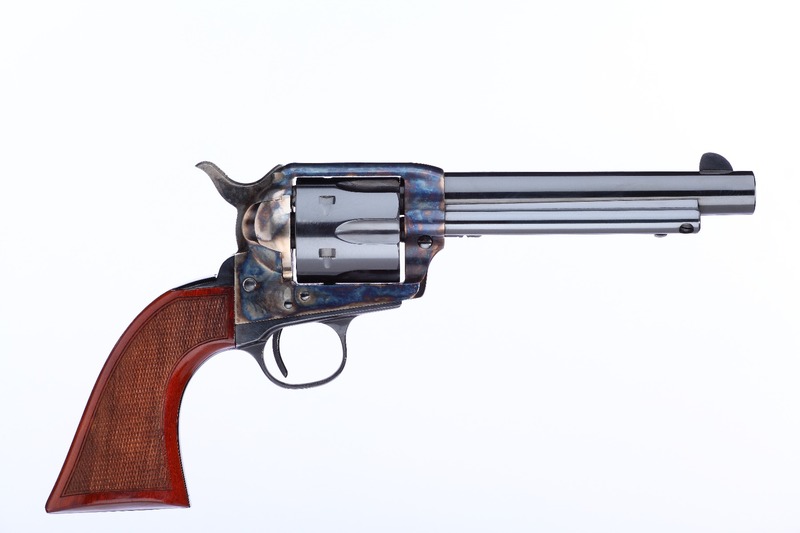 All of the previous features are available on both the standard and Taylor Polished versions of the Short Stroke revolvers. The Taylor Polished action on the short stroke revolvers includes hand polishing on most internal parts and some spring modification, however the spring pressure is left at factory settings for optimal performance. Inventory status may not reflect exact SKUs, please contact us to ensure immediate availability. Requires an FFL dealer to ship.